What is Intuitive Eating? Is it right for you? Find out in this guest post by Emily Kyle, MS, RD! Y’all have heard (or rather, read) me talk about how dieting and weight loss isn’t all it’s cracked up to be. If you haven’t seen it here, I’m sure you might have heard it elsewhere as the intuitive eating movement has gained momentum among health professionals and the wellness community. But what is intuitive eating, exactly? My dear friend and fellow RD Emily, of Emily Kyle Nutrition, is here to explain today. Emily is a blogger, wife and mama and she knows her stuff when it comes to health, happiness and intuitive eating. She also just launched an online course teaching the ins and outs of intuitive eating, so who better to tell you about it than her? Take it away, Emily! Both pregnancy and motherhood are no doubt life changing experiences in every single way, but I never anticipated how much they would change my eating habits over time. You see, during my younger years I really struggled with disordered eating. But during my pregnancy, I vowed to put my bad habits behind me and try to eat as healthy as I could for the health of my unborn baby. I figured that if I was going to gain weight anyways, that I could throw out all of my food rules out the window and start to eat whatever I wanted, whenever I wanted. Over time I had gradually dropped some of my food rules and felt more comfortable eating whatever I wanted. At the time I was breastfeeding, and thought that I needed the calories anyway, and that there was no point in restricting, and why not take advantage of the opportunity, right? This whole process was my beginning of my Intuitive Eating journey, I just didn’t realize it yet. When my son was 6 months old, something amazing happened. It was time for him to start eating solid foods, so I did was any good dietitian mom would do and made him organic baby food purees. And when I was done slaving over a hot stove and freezing them into little ice cube trays? He refused every single one of them. I was obviously concerned, why would he refuse this baby food? My research led me to a concept called baby led weaning. As I read about baby led weaning I realized that my baby was just following his natural, inborn hunger and innate wisdom cues. He was born with the wisdom to know what he wanted to eat, how much he wanted to eat, when he wanted to eat and why. I was stunned and amazed, and began to think, if he was born with this amazing wisdom surrounding food and his body, then aren’t we all? Was I born with this wisdom and naturally ignored it after years of diet culture and social media telling me I could in fact not trust my body? The concept was so interesting to me that I started to do more research on this idea and stumbled onto the concept of Intuitive Eating, a book written by Evelyn Tribole, MS, RDN and Elyse Resch, MS, RDN, CEDRD, Fiaedp, FADA, FAND. I read the book in three days, I could not put it down. The book reaffirmed all of the new eating habits I had developed over the past year, and assured me that it was OK to ditch those food rules that diet culture trapped me in for so long. Officially, Intuitive Eating is a nutrition philosophy based on the premise that becoming more attuned to the body’s natural hunger signals is a more effective way to attain a healthy weight, rather than keeping track of the amounts of energy and fats in foods. Unofficially, Intuitive Eating is a way of life. It is accepting that our bodies were born with the wisdom to know what we need from food, when and why. It is the ability to let go of the long-standing food rules and food cultures we have been accustomed to and learn to start marching to the beat of our own drum. But for someone who has never heard of Intuitive Eating before, it can be a really scary jump as it seems like you are throwing away all of the rules you have ever known for a practice that is more personalized, subjective, and ambiguous. 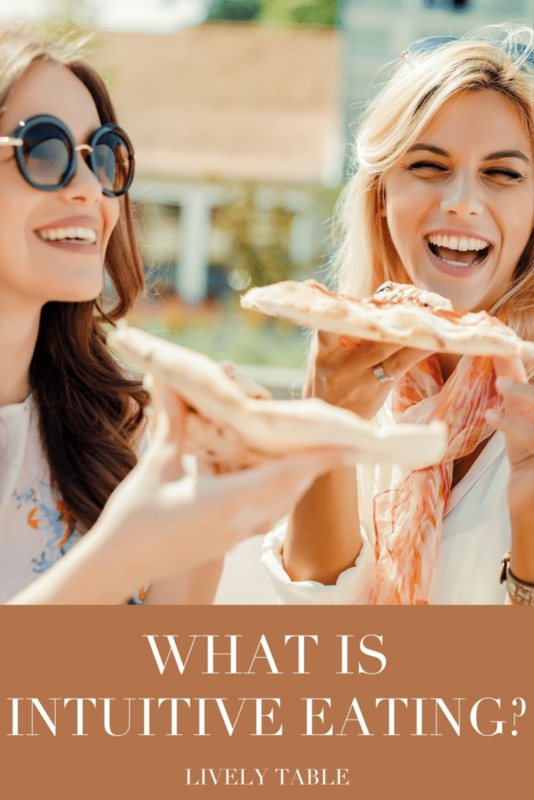 To help you get started, here is a breakdown of the 10 Intuitive Eating Principles outlined by Evelyn Tribole, MS, RDN and Elyse Resch, MS, RDN, CEDRD, Fiaedp, FADA, FAND to help you understand what exactly Intuitive Eating is. 1. Reject the Diet Mentality – For many of us, especially women, we have spent our whole lives thinking about our bodies, how to make them smaller, and what diet we should be on to achieve this. There are several scientific studies out there that show that dieting does not work, and in fact, can lead to unhealthier bodies that are more prone to gain weight. Rejecting the diet mentality is a critical step in learning to trust your own body and nourish yourself based on your own inner wisdom. 2. Honor Your Hunger – We have been trained to fear hunger, to see it as a nuisance which keeps us from reaching our ‘health goals’. But hunger is a biological feeling and mechanism designed to keep us alive and well. An important step when learning to adopt the practice of Intuitive Eating is to learn to honor your hunger and feed your body. Traditional diets are based on the concept of calorie restriction, which the body can view as starvation and drive the primal urge to overeat. “Learning to honor this first biological signal sets the stage for re-building trust with yourself and food”. 3. Make Peace with Food – Do you feel like food controls you? Like you have no control over yourself when you are around food? The idea behind this principle is to give yourself unconditional permission to eat. The food rules we have developed as a result of traditional diet culture has left us feeling like we are constantly making the wrong food choices and need to restrict certain foods that we have deemed as ‘bad’. Making peace with food gives yourself permission to eat without guilt or shame. 4. Challenge the Food Police – With the world of social media, it is not uncommon to be bombarded with unsolicited nutrition advice from ‘the food police’. From deeming foods as ‘good’ or ‘bad’, telling you what to eat, how to eat and when. These constant messages get planted deep into our minds and eventually become part of your psyche, making it hard to say no to the rules you previously held. Challenging the food police from both outside and inside forces is a critical step in becoming and Intuitive Eater. 5. Respect Your Fullness – We have been conditioned to view the feeling of fullness as bad, gluttonous, or guilt inducing that we have lost the body signals that help to indicate when you are no longer hungry. Reconnecting with your hunger cues and learning to respect your fullness will help you learn to trust your body and listen to your own inner wisdom. 6. Discover the Satisfaction Factor – Feeling satisfaction after a meal is nothing to feel guilty about, and in fact is the key to finding enjoyment in the eating experience. When you are able to find pleasure and satisfaction from your meals and the eating experience, you are better able to honor your hunger, respect your fullness, and help you feel satisfied and content. 7. Honor Your Feelings Without Using Food – Many of us have used food to at some point to soothe an emotion such as anxiety, fear, bordem, anger, and loneliness. While emotional eating is okay sometimes, it is important to be mindful about emotional eating and to find ways to comfort , nurture, distract, and resolve your issues without using food. 8. Respect Your Body – It is time to do away with the one size fits all standard of beauty. We are all beautiful and unique and it is time to accept your own genetic blueprint. Respecting your body and adopting the practice of body positivity is important when learning to nourish and care for yourself in a kind and compassionate manner. 9. Exercise–Feel the Difference – You will never be able to stick with an exercise program if you don’t actually enjoy it. We have been conditioned to think that the only way to exercise is grueling, sweat inducing experiences, but for many of us that is just not realistic. By shifting your focus on how you feel as a result of the exercise, you will be much more likely to enjoy it and stick with it. 10 Honor Your Health – The most important idea behind this principle is that you don’t have to eat a perfect diet to be healthy. “It’s what you eat consistently over time that matters, progress not perfection is what counts”. If you are a woman who is sick of the never-ending diet roller coaster and ready to make some long-lasting changes in your life, taking the time to learn more about Intuitive Eating will certainly give you a different perspective on health and wellness. You will learn to find freedom from food and learn to trust your body in the mean time. We all deserve a life without food rules, food restriction, guilt and shame so that we can instead focus on building a life of health and happiness. Intuitive eating can help you start that journey. So there you have it, an introduction to Intuitive Eating. Thanks so much, Emily!If you’re ready to start on the path of a healthier, more fulfilling relationship with food, I encourage you to learn more. If you’re ready to dive in head-first and commit to ditching the diet mentality for good, check out Emily’s School of Health and Happiness. It’s a 5-week online program with video lessons, a private support group, live Q&A sessions with Emily, and so much more! You will learn how to stop obsessing over food and give your body the love and nourishment it needs. Not quite ready for a deep-dive? I offer online nutrition sessions where we can take it nice and slow. Contact me about scheduling a free 15-minute discovery call! Disclosure: This post contains affiliate links, meaning I will get a small percentage of your purchase, at no extra cost to you.